Bagan huffed and puffed in the second half but they missed the cutting edge of Darryl Duffy upfront. Jeje had a game to forget as Norde carried the team's attack on his shoulders. Mumbai's tactics were clear they wanted to hold what they had. In the end they couldn't quite manage a win. Its two points dropped for Bagan while Mumbai are now 11 games without a win although they will take a lot from this performance. Its good evening from Kolkata. 90+6' There goes the whistle for ful-time. 90+4' Pritam's cross into the box and Balwan't bicycle kick goes over. 00+3' We've had a stoppage in added time. So there will be time added on to the scheduled minutes. 90+1' Yusa's shot from distance deflects for a corner. As it comes in the keeper is the sandwhich between Fereira and Jeje. The referee blows for a foul. 90' GOAAAAAAAAAAAAAAAAAAAL Bagan. Norde with a mazy runs into the box picks out Balwant on the far post and he can't miss. 88' Another long ball and its flicked on Wadoo makes an acrobatic clearance. 85' Another long ball and there's ping ball in the Mumbai box. It breaks to Jeje who picks out the keeper. Certainly not his evening or that of Bagan. 82' Two successive Bagan corners come to nothig. 81' Substitution Mumbai. Baljit off Sawhney on. 79' Long ball picks out Jeje but he can't get the ball out of his feets and the keeper collects. 78' Substitution Bagan. Souvik off Bikramjit on. A corner swung in and punched clear by the keeper. 75' Two big chances for Balwant. First off a cross his header rattles the post and then he shoots a second shot straight at the keeper. 74' Thoi stretches for a ball and looks tp have picked up a knoc. Can he carry on? 73' The referee has just had a word with Kashyap on the Mumbai bench. The head coach is definitely not pleased about something. 70' 20 minutes to go and Bagan growing ever more desperate for a goal to kickstart this revival. 67' Just when you think you have seemn everything in a game the game has a way of surprising you. 65' As the entire Mumbai team station themselves in the goal Norde takes it and hits it straight it into the wall of yellow. The follow up is volleyed high and not so so handsome. 64' Dramatic scenes. A long ball played forward by Bagan. Wadoo misses his kick and ends up giving a backpass which Kattimani collect. We have an indiredct free-kick. 61' Theobald with a striker's challenge on Souviks and gets a yellow. 59' Thoi fouls Norde in full flight. The free-kick is curled in but cleared. 58' Baljit bullies Bose off the ball but Fereira is there to clear. 57' Substitution for Mumbai Victorino off Anderson on. 55' Balwant's attemptged through ball is well cut out by Wadoo. 52' Mumbai still potent on the ciounter. 50' Norde's shot deflects for a corner. Norde takes it and as its partially cleared Souvik shoots staight at the keeper with him out of position. 47' Seubstitution Bagan Sehnaj off Prabir on. What a chance. Baljt put through on the run but his shot is straight at the keeper. 46' We are back on in the second half. What an half of football. Bagan looked like they were coasting when Pritam put them ahead from a corner. 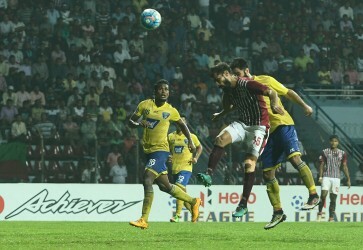 But two goals in two minutes from Thoi Singh and Victorino Fernandes flipped the game on its head. 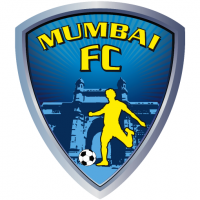 The Mariners have been woeful at the back and Mumbai could have scored 4-5. As it stands a massive second half coming up for both teams. Will the visitors hold out to break their drought or can Bagan rally? Join us to find out. 45+3' Norde with a good run cuts in and tees up Souvik whose shot from dustance flies over the bar. There goes the whistle for half-time. 45+2' Long ba;; played up top to Baljit. He controls, turns and shoots but straight at Shilton. 45+1' Bagan corner cleared as we gp into three minutes of added time. 45' Balwant wins the ball and finds Norde who appears to be blocked by Reagan but the referee waves play on. 43' Big few minutes for Mumbai. They need to go into the break with this lead. Can the hosts equalize? Norde corner and this time Kattimani punches as the Mumbai back four clear. 40' Bagan corner once again headed on but this time Fereira can't direct it into goal. 37' Bagan's defending has been pedestrian to say the least. 34' Bagan's evening goes from bad to worse. Debjit is injured and after some treatment has to be substituted. 31' Baljit crossess to Victorino whose header is just wide. Once again the Bagan marking is non-existent. Fereira is ball-watching and allows his man a free header. 28' Substitution Mumbai Clyde off Chinta on. 27' What a game this is. The crowd can't believe it. 25' Reagan drives forward, cuts in shoots. The ball bounces in front of Debjit who spills and Victorino could well have made it 3-1. 23' A long ball played by Bagan finds Jeje all on his own, The flags stays down but the referee blows for an infringement as the striker fluffs his lines. Handball. 22' GOAAAAAAAAAAAAAAAAAAL Mumbai take the lead. Reagan butrsts down the right and as Bose goes to sleep he picks out Victorino who sweeps itt into the net. 21' GOAAAAAAAAAAAAAAAL Mumbai. A cross into the bvox and a shot which is well saved by Debjit. But as play is recycled a shot from distance finds Thoi who deflects it into the net. 20' Pritam intercepts the ball and picks out Norde with a diagonal. He beatsd Wadoo but has his shot blocked. Balwant than has his strike saved by Kattimani. 15' Eduardo andBaljit in a foot race as Mumbai clear the ball upfield. The defender gets their first. 12' GOAAAAAAAAAAAAAAAAAAL Bagan. Norde's corner is flicked on by Yusa and Pritam is there at the far post for a neat finish. 11' Balwant cuts it back to Jeje. He turns and shoots wide. 10' Yusa and Norde combine well to find Souvik whose is blocked by Wadoo. 9' Yusa appeared to be tripped by the Mumbai left-back but the referee waves play on. 5' Thoi's cross cleared by Anas but Bagan give the ball away and as Victorino shoots Anas slips and puts Baljit through on goal but Debjits gets their first. 2' Reagan looks to burst down the right but gives the ball away in the final third. 1' We have kickoff in Kolkata and immediately a through ball to Balwant who is offside. 04:30pm The teams are out and kickoff is next. Stay tuned. 04:25pm Bagan hold sway in the head-to-head between these two teams with nine wins to Mumbai's three. Seven games have ended in draws. Mumbai XI: Kattimani, Reagan, Wadoo, Jalal, Kimkima, Clyde, Densill, Pratesh, Thoi, Baljit, Victorino. 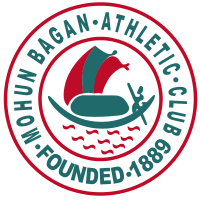 04:20pm Mohun Bagan XI: Debjit, Souvik, Pritam, Anas, Eduardo, Subhashish Bose, Sehnaj, Yusa, Balwant, Norde, Jeje. 04;15pm Both teams come into the game on the back of poor results. Bagan's unbeaten record was smashed in Goa as they lost to Churchill Brothers. 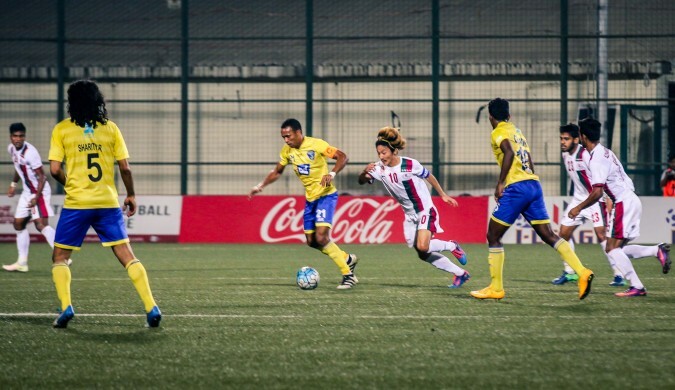 Meanwhile, Mumbai suffered a reversal away to league leaders Aizawl. 04:10pm This is a masive game for both teams. 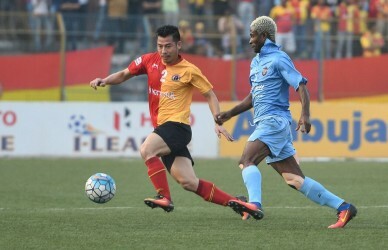 Mumbai are stuggling at the foot of the tabe without a win in 10, while for Bagan this is their chance to clo9=se the gap at the top after East Bengal's slip last evening. With games running out there is little room to manouver for either team, albeit at different ends of the table. 04:00 pm: Hello and welcome to the I-League game between Mohun Bagan vs Mumbai FC. This is your host Sourav Neogi from the stadium in Kolkata.